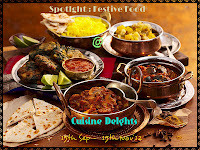 My event, SPOTLIGHT is featuring the festival season of India for 2 months this time and so will be up for 2 months, from September 15th till November 15th. 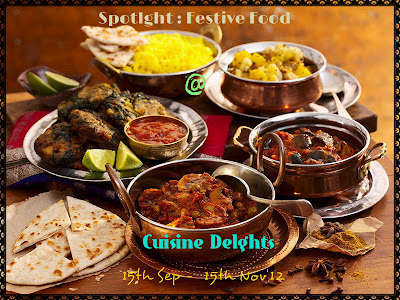 The theme is "FESTIVE FOOD"
Chandrani of Cuisine Delights is hosting the event. So, friends share your regional traditional festive food with us or whatever you serve your family during any celebrations or festival time. nice event happy hosting dear! I don't see any linky here..